With the final four matches of the Cruiserweight Classic's First Round, Episode 4 also featured the most high profile clash of the series so far, as current #1 Contender's to the NXT Tag Team Championships, Johnny Gargano and Tommaso Ciampa would face off for a place in the Second Round. Would the show manage to live up to the hype? The biggest match of the 1st Round ended up being the best match of the first round as Johnny Gargano and Tommaso Ciampa upped the game of the tournament with a cracking outing, that had the crowd hooked from start to finish. The storyline was simple and one that has played out numerous times around the world, two tag team partners and good pals having to face each other for a prize that they both wanted, a universal story that pretty much any viewer could invest in. Elements of the bout played off this, such as Ciampa removing his knee pad and then hesitating before making his next move, adding to the drama and protecting Ciampa, whilst also potentially offering future storyline direction for NXT. This would be added to with Gargano removing an elbow pad en route to victory. The embrace between the two that ended the show cleverly played on regular pro wrestling tropes and concluded with something refreshingly different. The action within this framework was to the high standard that most indy wrestling fans have come to expect for either guy over the last ten years. The clash built nicely from a series of strikes in the opening to a ridiculous sequence that would leave both down on the mat in the middle and a superbly well-flowing series that would conclude the match with a crucifix roll-up for Gargano, all the while throwing in strong near falls that easily could have ended the contest. The strongest of those near falls had to have come from Ciampa, who hit an air raid crash on the apron and Project Ciampa that both had the crowd convinced it was over. The only negative I've got for this match was that their just wasn't enough of it, the pair did an amazing job with just ten minutes, wouldn't it be great to see what they could do with fifteen or twenty? 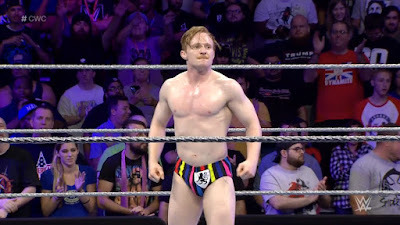 FSW's Jack Gallagher would make a real name for himself on his WWE debut, as the Full Sail Arena quickly took to Gallagher's technicality, as he picked up a victory over NEW's Fabian Aichner [Adrian Severe]. It was telling that Aichner was heavily booed by the Winter Park crowd, despite pulling out a number of impressive manoeuvers including a ridiculous powerbomb out of a guillotine choke from Gallagher and big double springboard moonsault. Daniel Bryan's enthusiasm for Gallagher on commentary also quickly got over to the unfamiliar home audience the skill of what they were watching, if the uber-technical Bryan was getting excited then Gallagher had to be something special. Gallagher came off as a much more extraordinary than fellow countryman and bigger name, Zack Sabre Jr. did on the previous episode en route to picking up the victory with a headbutt and a huge corner dropkick. The Tetsujin Shoot Style Tournament winner will face Dragon Gate's Akira Tozawa in the second round. In almost the polar opposite of Gallagher's debut, ICW's Noam Dar and ECCW's Gurv Sihra didn't have the best of introductions, in a match that struggled to find it's groove and even seemed to include a major production edit at one point. After a decent start, Dar and Sihra just didn't seem to connect with each other in the ring and the rest of the match lacked fluidity. Things weren't helped by a completely dead Full Sail Arena, who clearly didn't warm to either man quickly. Whether it was down to nerves, with this being both men's biggest TV exposure to date and the occasion got the better of them, I'm not too sure. Dar did finish strongly however, showing glimpses of the skill that got him to the tournament in the first place, getting a submission victory after transitioning a Fisherman's brainbuster into the Champagne Super Knee Bar. Hopefully we'll get to see a much more measured Dar performance against ZERO1 Hong Kong star, Ho Ho Lun. HHL's fellow ZERO1 Hong Kong performer Jason Lee was also in action on this week's show battling NXT's Rich Swann in a fun opening contest. The match was all about making Swann look as impressive as possible and he dominated his opponent, before pulling out a 450 splash for the win. After a pair of matches with Baron Corbin and Finn Balor on NXT TV in the first quarter of 2016, it seems like the Cruiserweight Classic is going to be a real vehicle to push Swann going forward, as he had one of the swiftest victories in the tournament so far and didn't put a foot wrong in doing so. Swann put on a show for the crowd who quickly got into his funky dancing, seranding him with his old indy theme song "All Night Long" by Lionel Ritchie. He'll face BELIEVE's Lince Dorado in Round Two. 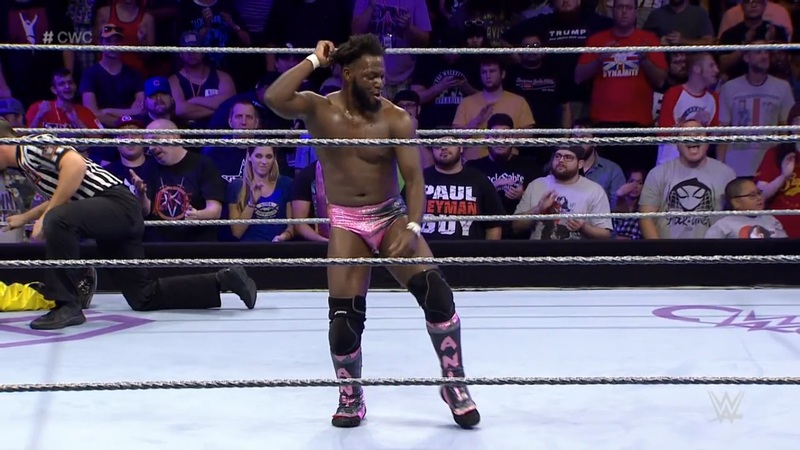 With two of the best matches the series has produced so far, the Cruiserweight Classic continues to impress. Tommaso Ciampa and Johnny Gargano put in a splendid effort in the marquee bout, whilst Jack Gallagher went out there and made himself a star. The average rating reflect the lacklustre Noam Dar v Gurv Sihra bout, as well as the glorified enhancement bout for Rich Swann. Still I'd say this was the 2nd strongest episode so far, only behind the more well-rounded Episode 2 [Akira Tozawa v Kenneth Johnson]. As we head into the 2nd Round, with 16 men left and names like Japan's Kota Ibushi and Akira Tozawa, England's Zack Sabre Jr, Mexico's Gran Metalik and USA favourite Johnny Gargano still left in the tournament it has to expected that the action is about to reach at whole new level.